The Group configurations can be customized from Advanced Settings after the group has been created. The advanced options include changing the group types, changing group member roles, email moderations and so on. You can view a list of all the groups that are created in your organization by logging in to mailadmin.zoho.com and navigating to the Groups section. Alternatively, you can also access the Groups menu using this link. You can search for specific groups using the search toolbar on the top right corner of the Groups page. In case you have multiple domains configured for your organization, you will see a Filter option next to the search toolbar. Click the drop-down next to the filter icon to see the domains listed. You can click on any domain to view the related groups. Zoho Mail provides many options in the Group listing page, that makes it easy to perform certain functions on groups. You can add new groups, export group details, apply email policies and delete groups. The exported group details are saved as .csv file. While exporting, you can encrypt the .csv file with a password by selecting the Encrypt with Password checkbox in the Password Encryption pop-up. You can use the Add Group option to add groups to the organization. You can choose the group details and add the group. In case you need to export group details you can make use of the Export Groups(s) option from the Groups listing page. You will be able to find three options in the export menu. If you click the Export Group option, all groups associated with your organization will get exported as a .csv file. If you have selected certain groups using the checkbox, and click the Export Group option, you will find an additional Export selected Groups option. This will export only the groups that you have selected. If you filtered groups by domain, and then select the Export Group option, you will find an additional Export all filtered Groups option. This will export all the groups created for the selected domain. You can apply email policies to Groups from the listing. When you click this option, all configured policies will be listed. You can select the required policy, and apply it to the groups on your listing. You can also add a new policy by clicking the Add New option in the listing. You can select groups using the respective checkbox, and click the Delete option from the top menu. From the group listing page, you can click on a particular group to view the specific details of a group. Go to the Groups tab, and select General. 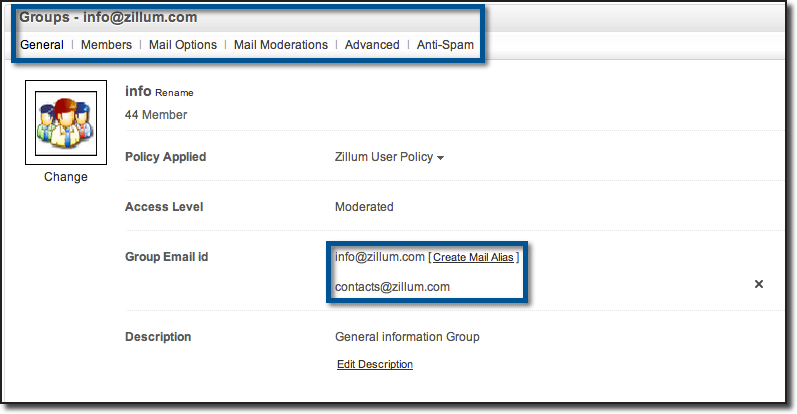 Across the Group Email ID option, click Create Mail Alias. The administrators or the group moderators can add members to the group. The administrator can change the detailed configuration information of members or change their role from the Members section. Login to www.zoho.com/mail as Admin or Moderator of the group. Select Control Panel >> Groups if you are an admin. Select the Group for which you want to manage members. Select Members tab to view the list of members in the group. The options to add new members to the group is available in the right panel. Click 'Select and add users from Org' to view and select the users from a popup. You can click 'Select all members from the Org' to select all users of the organization to the group. We recommend you to check whether you want all the organization members to be added to the group before you use this option. You can also provide the email addresses of users, separated by a comma to add users by their email addresses directly. When you add external members to the Groups, the external member will receive an email confirmation to accept the membership to the group. 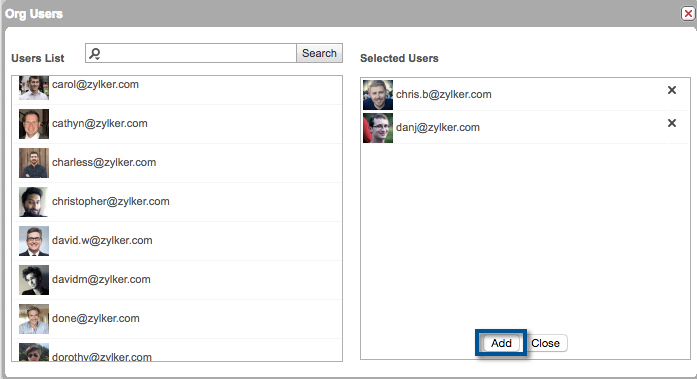 Once you've added all the users to a group, you can perform actions such as changing the role, bulk deleting users etc. You can select some of the group members and allot a specific role. Select the users whose group roles you'd like to change. Click the Change Role drop-down, and choose the required role. Generally, all group members are listed when you view the group details. If you want to view the moderators or the group members alone in that view, click the View option, and choose either Moderators, Members or Pending Invitations from the listing. You can export the group details of the some of the members. Choose the Export option, and pick whether you want to export the details for all users, members or moderators. The respective details will be exported in a .CSV file. The exported Group member details are saved as .csv file. While exporting, you can encrypt the .csv file with a password by selecting the Encrypt with Password checkbox in the Password Encryption pop-up. Select a group of users from the listing, and click the Remove option to remove the selected users from the group. A list of all the groups a user is a part of will be listed in the User Details section of that specific member. Go to the User Details section, and select the relevant user. Select the Mail Accounts tab. Under Member Of, you'll be able to view all the groups in which this user is a member. If you want to add this user to a group, click the Add Group option. All the groups that have been created in the organization will be listed. Select the checkboxes across the relevant groups and click Add. When the groups are moderated groups, or organization/ private groups with restrictions, the emails will be held for moderation, based on the permissions and the group delivery settings. The moderators of the group or the administrators of the organization can moderate the group to clear the emails held for moderation. The emails that appear highlighted, are possible Spam emails and are denoted by the Spam icon. The email headers will appear in a popup on clicking the From column. Based on the headers, the emails can be Approved or Rejected. The Advanced Settings for the group, can be used to customize the Email delivery options, Notification settings, Group type (Access level) options. The administrator can also define the email addresses or domains which need to be restricted or moderated even in public or other groups. In addition, the administrator can also add the external email addresses or domains which should be directly allowed to send emails, even in moderated groups. The Access Level Settings are based on the type of group required for the organization. There are customized options available to manage the groups and the access levels. Anyone can send email to the group. All the emails will be delivered to the group members. Only the members of the same organization can send emails to the group. When others send emails to this group, the email can be moderated/ bounced to senders, based on the option chosen in Email Moderation section. Only the group members can send emails to the group. Only the group moderators can send emails directly to the group. When others send emails to this group, the email will be moderated. However, the individual member/ moderator permissions can also be customized from the members section. Notify Moderator(s) when an email is held in Moderation: If selected, all the moderators of the group will receive a notification email, whenever an email is held in moderation. The moderators will be able to view the email content in the notification and approve or reject the emails. Notify Author when his email is rejected: If selected, when an email to a moderated group is rejected by the moderator, the sender will receive a notification email about the rejection of the email sent to the group. Notify Moderator(s) after an email has been approved or rejected: When there are multiple moderators to a group, this option can be used to know whenever another moderator has approved or rejected an email held for moderation. 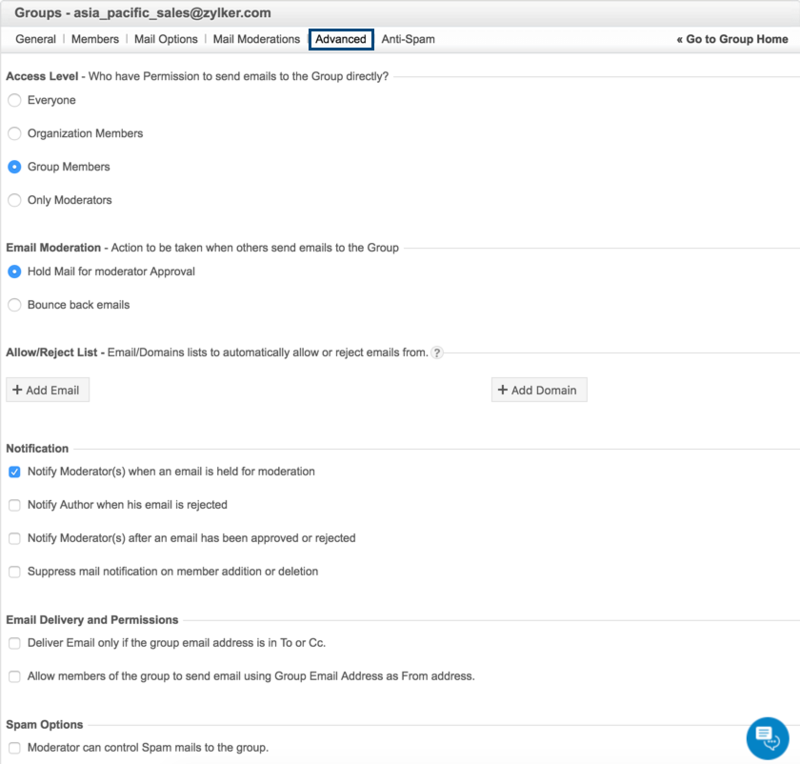 Suppress email notification on member addition or deletion: The users receive an automated email, whenever they are added to a new group or removed from a group. If the option is selected, the notification email about the group membership will be suppressed. Deliver Email only if the group email address is in To or Cc: If selected, the emails with group email address in Bcc will be held in moderation. Only the emails which are addressed to the Group and in To/ Cc will be delivered. Allow members of the group to send email using Group Email Address as From address: In some cases, the group members need to reply from the Group email addresses and not from their individual user accounts. This is highly applicable for public customer/ client facing groups like support/ sales and specialized groups like hr, social media etc. If the option is selected, the group email address will be added as From address for all the group members. When replying to the emails sent to the group, the group email address will be set as the From address automatically. The administrators can override certain settings for the members using the custom member settings for the group. 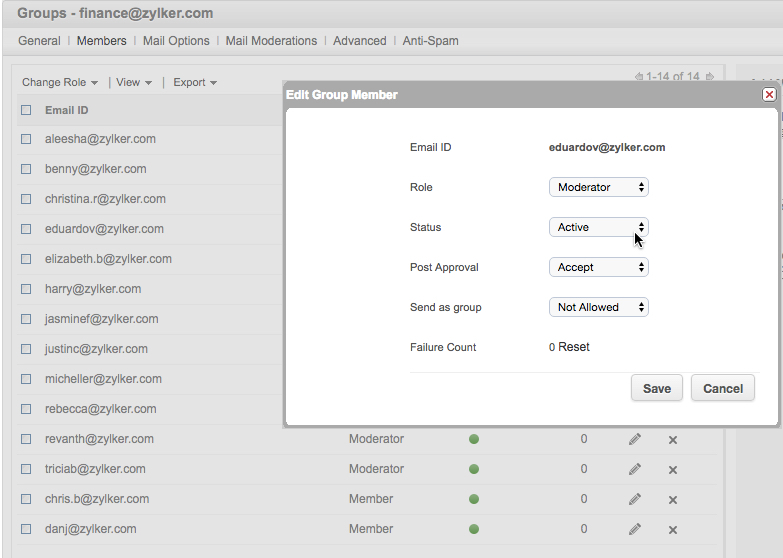 In the Post Approval - select 'Accept' to allow the member to send emails to a moderated group. Click 'Hold' to hold the emails in moderation. 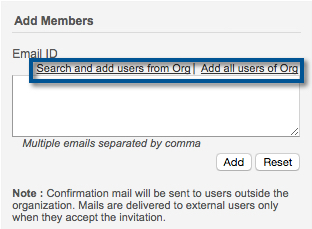 In the Send as Group - select Allowed, to add the group email address as a group email alias for the member, to use it as a From address. Select not allowed to not allow the member to use the group email address in the From address section. In case of external group members, any failure of 10 will make them inactive. 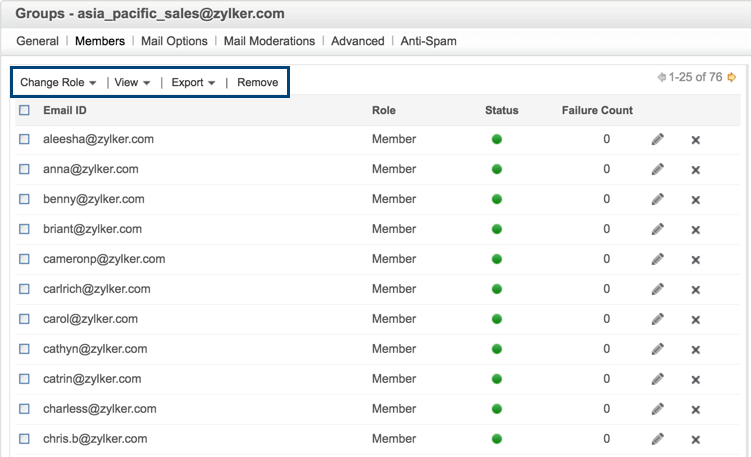 The administrator can click Reset to reset the count of failures and re-enable email delivery to the external members. In the Groups Spam Control, the administrator or moderator can add the blacklist email addresses/ domains for the group. Similarly, certain email addresses can be whitelisted for the Group, for the emails to be delivered to the Inbox of the users. Generally, the Organization Blacklist/ Whitelist takes preference over Group/ Individual Blacklists/ Whitelists. Select Spam Control to add some emails/ domains to whitelist or blacklist. In the ‘Quick Add’ section in the right, select Black List or White List. The whitelist and blacklists help to determine whether the incoming emails from the specific domains/ email addresses need to be classified as spam or not. In addition to the whitelists/ blacklists, the administrator can also add domains/ email addresses to the accept or reject lists. The accept and the reject lists are available for all types of groups. When a group is a moderated group or private or organization level groups, there are some restrictions when external users send emails to the group accounts. This causes some emails to be moved to moderation when sent from external domains or email addresses. However, the administrator will have some exceptions, where they need to automatically allow emails from some external accounts directly, without the delays caused by moderation or groups not getting the emails due to bounces. In this case, the administrator needs to add the email address or domain to the 'Accept' list. Even in cases, where the group is a public group which needs to receive emails from everywhere, the administrator may need to restrict emails from certain domains or email addresses by either bouncing them or by having someone to moderate the emails. Such email addresses or domains can be added to the reject list. When you are not sure if you want to reject the emails from specific domain/ email address, and also do not want to directly deliver email from these addresses to the groups, you can add them to the moderation list and hold them for approval. Click Groups and select the Advanced tab. 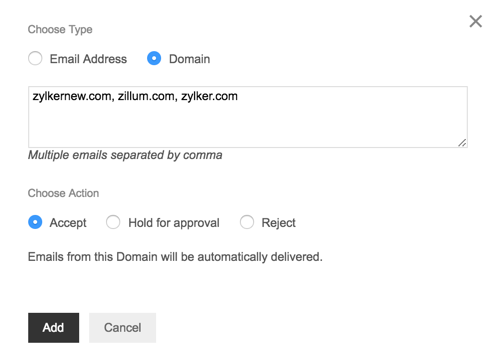 Under the Accept/ Reject lists, select the 'Add Email Address' or 'Add domain'. Provide the domains or email addresses to add it to the list. You can add multiple email addresses or domains by separating it with a comma. Select whether you want to add it to the Accept/ Reject or Hold for moderation lists. Click Add to complete the action. Based on the type of Group chosen, only some content is valid for the Group. Provide customized content and click Save to save the changes.